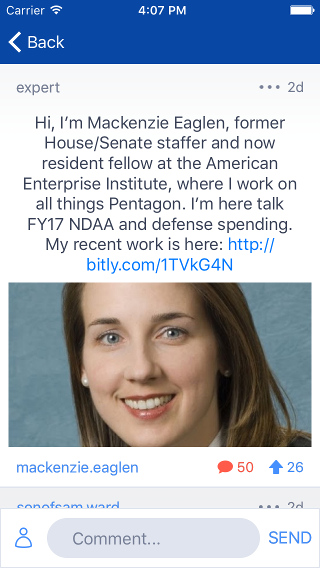 Mackenzie Eaglen is a resident fellow in the Marilyn Ware Center for Security Studies at the American Enterprise Institute, where she works on defense strategy, defense budgets, and military readiness. She joined us on Tuesday, May 17 to discuss the NDAA and defense spending reform. @conspickle: Hi Mackenzie, thanks for visiting us. How do you feel about House Republicans stripping the provision requiring women to register for Selective Service? Thanks for having me today. It is a purely political move designed to protect members from taking a tough vote in a presidential election year. But it is certainly a debate worth having, and I think the Senate is going to do exactly that. They also may not take a vote but I expect a floor discussion on women and the draft in the US Senate after their bill keeps the provision. Sen. McCain raised a great point when explaining why he included the provision to have women register. He said we will never utilize the draft again, and he's most likely right. But this is the kind of national-level debate voters hope their elected officials will have. If McCain is right, why not abolish the draft outright? @sonofsam.ward: There seems to be more uproar recently over the contracting process (more calls of insider deals than in the past). Do you think this is true and if so how should the process be changed to make it more fair? The most salient one in recent memory is Lockheed suing over Oshkosh getting the contract to replace the Humvee, and the grumbling over the B-21 contract even though no legal action came of it. I share your frustration in general, but those examples were all competitively bid and awarded. I am more concerned currently about sole-source contracts and backdoor equivalents like that in section 808. But not all sole-sourcing is bad and there is often a logical case for the taxpayer and warfighter to do so. Would evaluate on a case-by-case basis. @sonofsam.ward: When will the DOD modernize its budgeting software? Fair question when referring to the sporadic and intermittent provision of budget documents to Congress after release of the president's annual budget. The materials come over to the Hill in fits and starts and it is frustrating.This also slows the ability of staff to do their job quickly and get a holistic picture right off the bat. Unfortunately, updating DoD budget software is not a priority for the Department as far as I am aware. Nor is Congress pushing the issue. @wall.chambers: How do we strengthen oversight over defense contractors? Every year it gets to be more and more of a blank check hole for taxpayer money. This is a shared concern in both parties and one reason why both authorization chairmen have made acquisition reform a priority, as well as the guys before them (e.g. Sen Levin). I think a fair amount of progress has been made in contractor oversight in recent years by Congress. One area that is grossly under-examined, however, is in regards to the purchases of services (not weapons). See my report here. I hope this is the next phase of "reform" in 2017. @hagan.crow: Hi Mackenzie. What are your thoughts on the "New Balance" amendment offered by Mr. Sanford? Having worked for a Sen. from Maine, I am familiar with New Balance interests. I share the administration's position in the SAP, which states this provision (sec. 808) likely benefits only one company disproportionately, essentially serving as preferential treatment for them. @leahy.colhoun: Hi Mackenzie, in your reform agenda report, you have an interesting graph on the distribution of DoD contracted services, and noted that because DoD keeps changing their accounting practices, that it's tough to track these changes over time. Who's taking advantage of this knowledge gap? Thanks for taking the time to read the report. Without robust oversight by Congress in DoD services acquisition, the undersecretary for AT&L and the services' contractors have the advantage so to speak. One recent egregious example is Congress continuing to ignore real contracting mishaps, such as the “lowest price, technically acceptable” solicitation for a $17.5 billion IT contract. @long727: There's an LNG export amendment in the NDAA. Do you think exporting gas to our allies really offers security benefits? Good question, and I’m not totally up to date on this issue of the security benefits to allies by exporting gas. But I see no harm outright and think anything we can do for our allies these days is generally helpful given our pullback from many places for a variety of reasons (chief among them: Budget Control Act). @the.lan: How can we justify building 52 Littoral Combat Ships if Ash Carter and the Pentagon are only requesting 40. In general, the argument that "the Pentagon only requested x" of some procurement so Congress should obey warrants a deeper dive. The president proposes in his budget, but it is up to Congress to dispose. The executive branch is not always right. We would not have drones flying today without Congress forcing them (through earmarks) on the Defense Department, for example. Re: LCS, the question is not what the Navy asked for this year, but whether it was driven purely by the $18B budget hole that DepSecDef Work and others have spoken of in the past. Given the Navy did not request an additional LCS in its unfounded requirements list, I would want Congress to attempt to keep all options open for now and live to fight another day/revisit the issue next year with more info and analysis from the Navy. @hagan.crow: Russell's approved amendment seems to be getting a lot of traction in concern to religious freedom for federal contractors. Thoughts? I am no lawyer nor am I an expert on the Civil Rights Act, so I would like to tread carefully here. There are serious concerns and allegations raised against this amendment that must be answered clearly before I could offer judgement either way. It is indeed a headline issue and will remain so throughout the NDAA conferencing. @iraqi.tobaccy: Does the service contracting bloat have anything to do with buddy deals? I leave the service, start a contracting firm, my old CO sends me business? It is really surprising to see knowledge based services outspending everything else. Great question, but neither Congress nor DoD knows the answer because the department does not collect the data. One problem among many in the lack of oversight of defense services contracting, which is now bigger than the money the US military spends on weapons systems. @morrow.fish: Should DoD contract a third party consulting firm to implement effective personnel management and retention policies? First, Congress and the military must have a robust debate about what personnel and talent management reforms should be implemented at the Pentagon. Right now, there is stifled dissent inside the building; the Chiefs are not in agreement; and, the undersecretary resigned in frustration. There is a role, however, for outsider businesses & consultants once answers are identified. The under secretariat for Personnel & Readiness is known to have a major problems, morale challenges, bureaucratic inertia and a toxic environment. As many voices in this discussion as possible can only help at this stage, but I would suggest a "crawl, walk, run" approach, and the 2 branches are not even "crawling" on these questions yet.